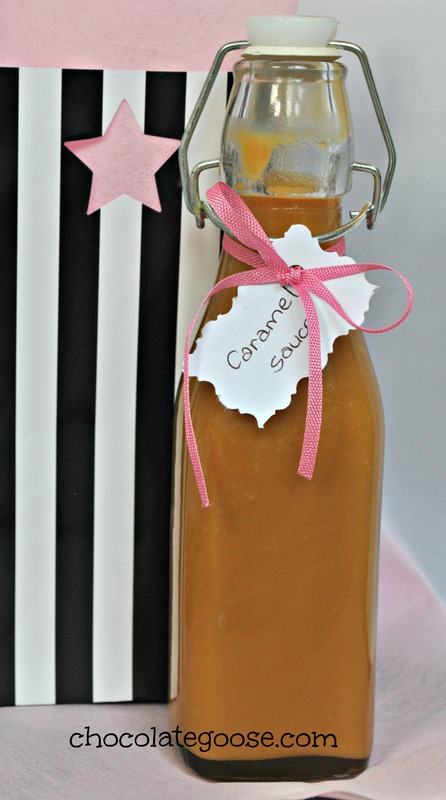 Salted or Sweet Caramel Sauce – you decide! I’ve been wanting to make this sauce for ages now and I finally got round to it, although I’ve discovered it is a little fiddly and you have to watch it ALL THE TIME so don’t even attempt to do this if you aren’t guaranteed a good half hour of uninterrupted concentration. It’s super delicious on vanilla ice cream, or spread between the layers of a cake, cupcakes, cheese cakes or even bottled and given to friends as a thoughtful homemade gift. And probably another 100 uses I have yet to think of. Take note that it can solidify when cold, so don’t be alarmed if you do decide to bottle it and then have a moment of panic as you wonder how you’re going to get it out of the bottle! Yes, I did that! But placing the bottle into a bowl of very hot/just boiled water soon has the gorgeous gooey amber coloured liquid flowing again. Or put it into a jar with a screw on lid for easier access and spoon it over or into whatever you’re making. Apparently whether it solidifies or not is determined by the temperature the liquid was allowed to get to…but that’s way too much chemistry for me! I even added some ground sea salt flakes to it to make it the very trendy Salted Caramel, but you can leave that out and stick with the original if you prefer. Working with sugar is always tricky and you begin this sauce by melting/dissolving the sugar. Some people add a little water to help. I’ve read that this is because sugar boils at a much higher temperature than water, so the water is there to “get things going”. It also allows the sugar to come to temperature without burning. I admit I used water. I wasn’t brave enough to try it without the liquid assistance and imagined burnt caramel sticking like glue to my saucepan. This recipe yields about 1 cup and lasts in the fridge for up to two weeks. Having cream as a major ingredient would make me nervous keeping it longer than that. It’s best to remove the pan from the heat before adding the cream as the mixture can bubble upwards rapidly. Make sure that your saucepan is large enough so it doesn’t boil over. I prefer to remove it and be sure to avoid splashes as the syrup mixture is hot! Place the sugar and water into a heavy-based saucepan and heat gently over a medium heat, stirring until the sugar has dissolved. Turn the heat up to medium-high and let the syrup come to the boil – DO NOT stir the syrup, no matter how concerned you are about it burning. You are allowed to gently swirl the pan occasionally as it simmers, until the caramel turns a rich amber colour. Remove the pan from the heat and add slowly add in the cream and salt. Then add the cubes of butter and stir until melted and combined. Set sauce aside to cool completely. Tip: If you are making a sweet sauce and omit the salt, you may want to add a dash of vanilla extract.